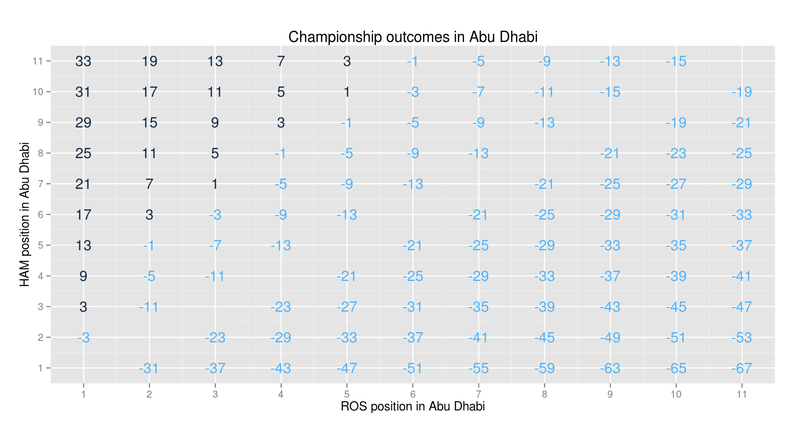 I tweaked the code for my F1 Drivers' Championship winning combinations explorer to show how many points each driver could win - or lose - by in Abu Dhabi, assuming I've got my sums right. So if Rosberg wins, he loses the championship by 3 points if Hamilton comes second, but takes it by 3 if Hamilton comes in third. If Hamilton fails to finish, and Rosberg comes in 6th, Rosberg loses it by a single point. If Hamilton is 10th, and Rosberg 5th, or if Hamilton is 7th and Rosberg is third, Hamilton wins by a single point. And so on.